Located at an elevation of 5400 feet in the mountains of north central Arizona, the City of Prescott (population almost 43,000 in 2008) was the original territorial capital of the Arizona Territory. Prescott is home to several colleges including Yavapai, Prescott College, Emory-Riddle Aeronautical University, plus other specialty campuses. 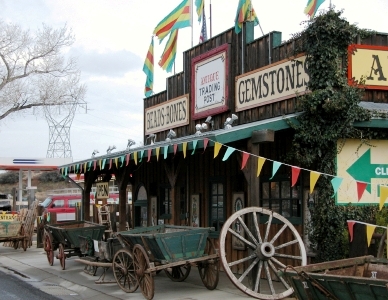 This old mining town borders the Prescott National Forest to the south and west. Many active adults 55+ have moved to Prescott for its warm climate and interesting setting. The variety of housing choices keeps increasing to meet the demand of baby boomers who would like to retire here. You can choose to live in town or outside in an active adult community, many of which are gated and golf-oriented (see link at top left to Prescott Active Communities). Zillow.com reported the median home value was $364,200 in early 2019. Prescott is in the mountains north of Phoenix. At an elevation of 5400 feet it has cooler summers than most of the rest of Arizona. If you love the outdoors and majestic scenery, this is a great place. The average July high temperature is 88 and the average January high is 51 (the average low is 23). The wettest month is August (3"). Prescott has a vibrant cultural environment. Leading institutions include the Fine Arts Association, Sharlot Hall Museum, Phippen Art Museum, Folk Arts Fair, Frontier Days, and Territorial Days. Yavapai College and Prescott College, along with Embry-Riddle Aeronautical University are located in Prescott. Crime here is a little less than the national average. Love Field is the Prescott Airport. Phoenix Sky Harbor is about 80 miles away. Prescott is below average in walkability when compared to other communities.